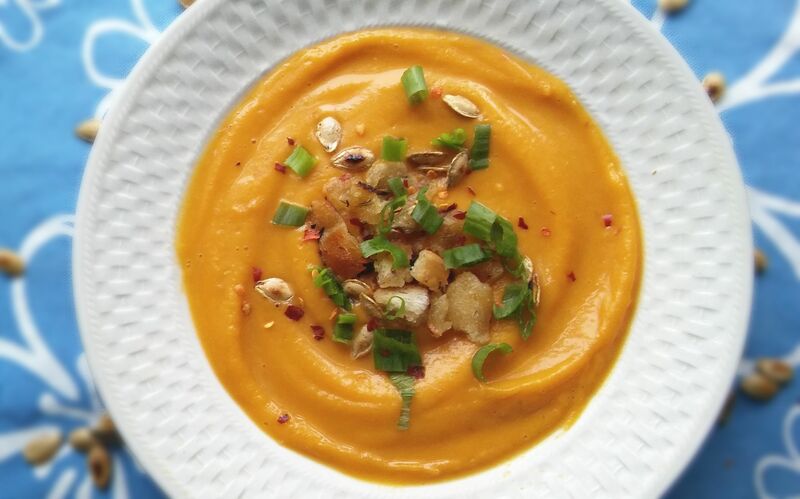 Spicy pumpkin Soup with Roasted Pumpkin Seeds and Garlic Croutons makes a warming lunch or appetizer on a cold and chilly day. Pumpkin is so full of delicious sweet flavour, that I minimise ingredients added to it. That is why this is such a simple and beautiful dish to prepare. 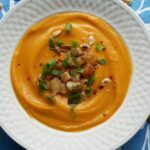 This is a soup that can be a simple lunch or a well garnished appetizer for for a dinner party. Speaking about garnishing, roasted pumpkin seeds not only makes a beautiful garnish, but is packed with healthy nutrients. They are very high in magnesium which help control your blood pressure, regulates blood sugar levels and forms and maintains healthy bones. It is also very high in dietary fibre. pumpkin seeds contain an amino acid called tryptophan, which helps promote sleep as well. So don’t throw out these little powerhouses of health, roast them and enjoy the great health benefits which they provide. Garlic and herb croutons also add such a wonderful taste and texture to the soup . I am a really big fan of croutons especially garlic and herb flavoured so you will also find that I have used it in my recipe for Corn and Potato Chowder with garlic and herb croutons. Just cannot get enough of this crunchy deliciousness? You are really going to be amazed at how easy it is to prepare this soup, but just how satisfying and sumptuous it is. Just start by frying a medium onion, with a small green chilli, ½ teaspoon chilli flakes and ½ teaspoon chilli powder or peri peri in a 15ml of butter. Cook for 5 minutes. Add 500g peeled and cubed and seeded pumpkin, into the pan. Save the seeds for roasting. Cook for 5 minutes. Add ¾ cup water to the pumpkin, just covering it halfway. Add ½ teaspoon salt and cover with a lid. Cook until the pumpkin is soft and add a ¼ cup of milk or cream to the cooked pumpkin. Empty all ingredients into a blender and blend until smooth and creamy. Add a little more milk or cream if you feel that it is too thick. Wash and drain the pumpkin seeds, which you removed when peeling and cubing the pumpkin. Place in a pan with a tablespoon of olive or vegetable oil on medium heat. Fry until the seeds swell slightly, for about 5 minutes stirring often, to avoid burning. You will need about a ¼ loaf of bread cut up into 3cm / 2 inch cubes. 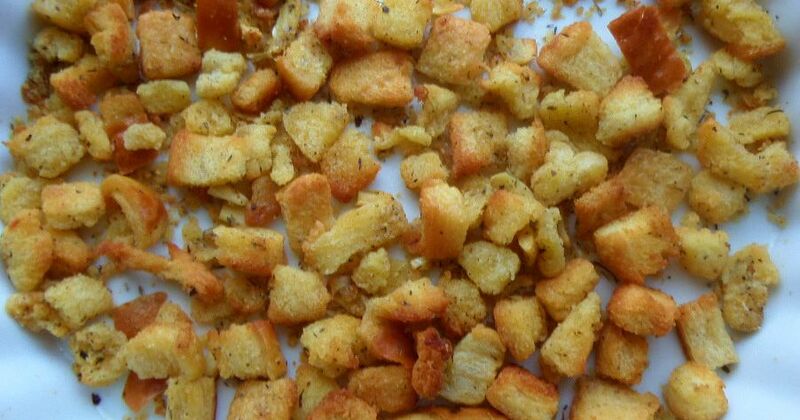 It’s a good idea to leave the crust on the bread, because it will give the croutons some extra crunch. Drizzle or roll the bread cubes in the seasoned oil until evenly coated. Spread the coated cubes of bread onto a baking sheet and bake at 180°C for about 10-15 minutes. The bread cubes can also be tossed around in a frying pan on medium heat, if you do not want to use the oven. Just ensure that you move them around in the pan every few minutes, so that they do not burn. 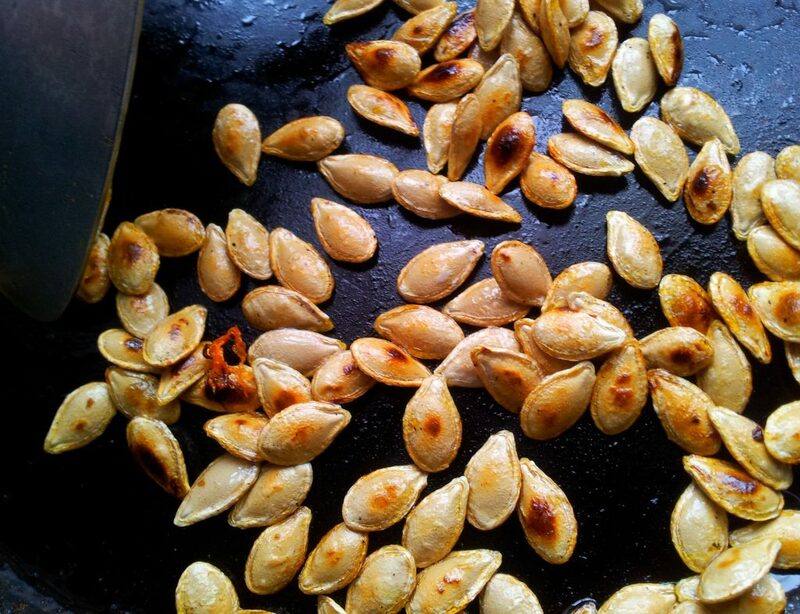 Remove the croutons from the oven or stove and toss a few into the soup with the roasted pumpkin seeds. Garnish with chopped spring onions and enjoy hot as an light lunch or appetizer. 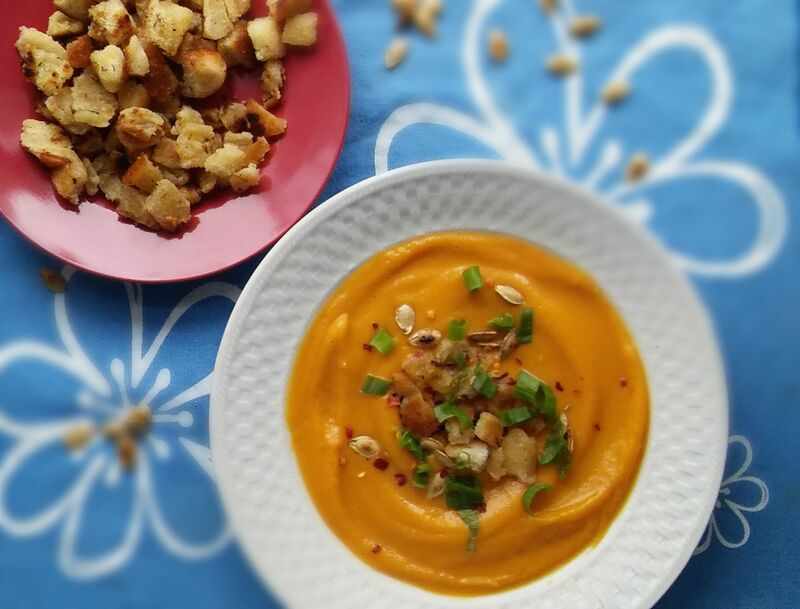 Spicy Pumkin Soup with Roasted Pumpkin Seeds and Garlic Croutons makes a warming lunch or appetizer on a cold and chilly day. Heat the butter or margarine in a pan on medium heat. Add the onion, chilli, chilli flakes an chilli powder or peri peri. Cook for between 4 to 5 minutes until the onions are softened. Add peeled, seeded and cubed pumpkin, into the pan. Save the seeds for roasting. Cook for 5 minutes. Add ¾ cup water to the pumpkin, just covering it halfway. Add salt and cover with a lid. Cook until the pumpkin is soft and add milk or cream to the cooked pumpkin. Wash and drain the pumpkin seeds, which you removed when peeling and cubing the pumpkin. Place in a pan with a tablespoon of olive or vegetable oil on medium heat. Fry until the seeds swell slightly, for about 5 minutes stirring often, to avoid burning. Simmer oil, butter or margarine, garlic, dried mixed herbs and crushed chillies in a pan. Allow this to simmer just until the butter or margarine has melted. Remove from the heat and allow the flavours to infuse while you chop up your bread. Cut up a ¼ loaf of bread into 3 inch cubes. Drizzle the oil or roll the bread cubes in the oil until evenly coated. You can either bake the seasoned bread cubes at 350°F / 180°C in the oven for 15 minutes or fry them in a pan, on the stove for 15 minutes, just until they are crunchy.Remove the croutons from the oven or stove and toss a few into the soup with the roasted pumpkin seeds. Garnish with chopped spring onions and enjoy hot as a light lunch or appetizer. The soup is creamy deliciousness. But, I’m totally in love with roasted pumpkin seeds. You did think of the whole pumpkin Ashika. It adds such a lovely contrast in color and texture!!! Thanks Maria…like I mentioned to Kelsie,I really love these seeds and it was either to be tossed into the garden or the soup and the soup won…and it tasted great. Have a great week ? Haha…I see that you love soup as well…. Oh yes,The seeds and croutons definitely add a great finish. This looks like an amazing pumpkin soup Ashika. Lovely, thick and warming. I’m a big one for soups and I’ve pinned this to my “must try” list. Definitely one of my favourite comfort foods. Thank you for pinning. I am really looking forward to checking out your soup recipes on your blog as well. Haha…It is also one of my favourite snacks as well and I just didn’t have the heart to toss it out into the garden so I decided to roast it and toss it into the soup instead ? Looks so creamy and delicious. 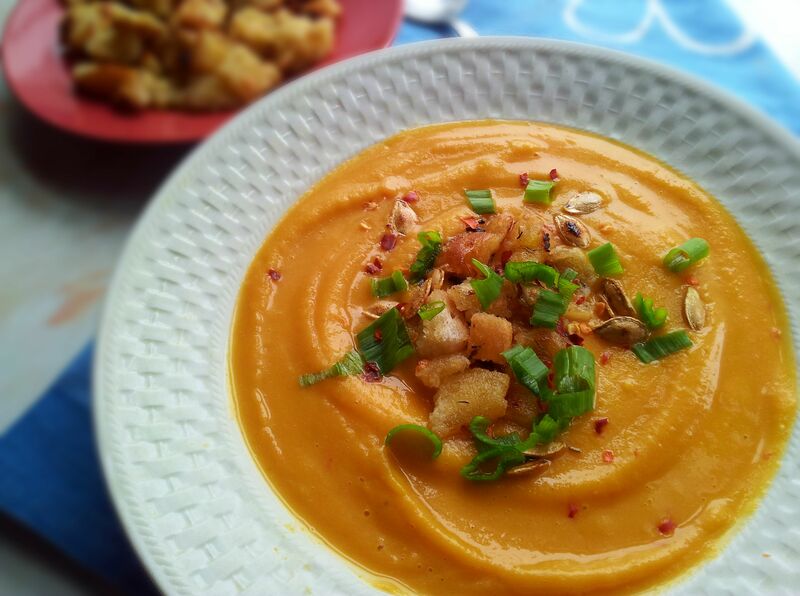 I am such a soup lover and this pumpkin soup just sounds perfect on a cool night! And those croutons!! Yum!!! Thank you Kelly. I also just love soup…it is so comforting and delicious. Have a great day ? Yes this soup is perfect, it looks so rich and creamy. I’d love a bowl for my lunch I’m making it as soon as I get my hands of a fresh pumpkin. Thank you Emma,I hope that you will love it as much as we do. Let me know how it turns out ? This soup recipe combined some amazing ingredients! So creamy and mouth-watering. Would you say that this is a winter recipe? Thank you Agness,it certainly does make a great winter recipe, but we love it almost year round. Thank you for stopping by, have a great day. Haha..I know what you mean Katherine,I also loooove these pumpkin seeds,they really compliment this soup. That soup looks amazing Ashika!! Creamy and so yummy!! The simple yet flavorful garnish is lovely on the top!! Thank you Deepika, this soup is a favourite in my home…because of the garnish? A beautiful soup! I love that it is spicy also, and you recommended Peri Peri sauce – one of my favorites! Thanks for the recipe! Thank you Laura, the spice and especially per peri really adds a great flavour,not too hot…just right. I am glad that you like it too!? Thank you Heather, the croutons definitely add the yum to this soup…big,big favourite in my home.? What a great fall soup!! I love how you offset the creaminess of the pumpkin with the crunch and texture of the croutons and pumpkin seeds. Yum!